It’s a great honour to have been elected Chairman of the British Cattle Breeders Club as we look to build on this year’s success and plan towards the Club’s 70th Anniversary Conference next January. As we move towards a new era for UK agriculture post Brexit, we have the opportunity to focus positive attention on breeding beef and dairy cattle that will suit our systems, meet consumer perceptions and fulfil market requirements. We have a huge amount to be proud of in the UK, with world-leading research and development in genetics. We are the first country in the world to have a breeding index for dairy farmers to help in the fight against bovine TB (TB Advantage) along with a fantastically diverse range of farming systems to maximise market potential. As a club, we are proud of the support we draw from the farming community, researchers, industry and students. Throughout 2017 we will look to strengthen these links, especially with the colleges and universities. Our aim is to provide the next generation with the latest research and information to encourage them to embrace and influence the future of UK breeding and genetics. As we develop the programme for the 70th Anniversary Conference, we will look to secure speakers who will be thought-provoking, informative and challenging, while promoting our strengths and encouraging discussion. I strongly believe this is a great time to be involved with breeding and genetics. We face some challenges, but with the speed of genetic change the UK cannot afford to be left behind. Although it takes 10 years for the full effect of breeding decisions to be seen at herd level, the way in which we make these decisions seems to change month on month as genomics, gene editing and other new sciences emerge and develop. 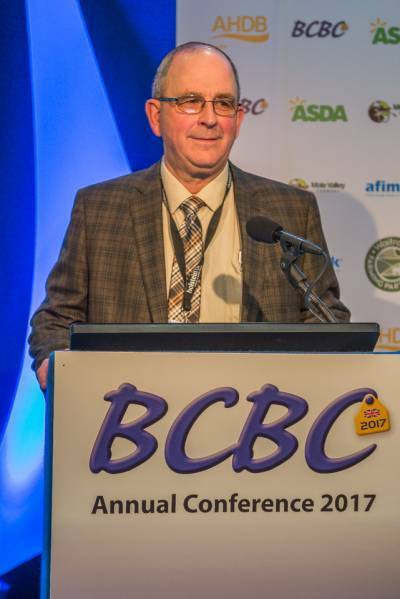 If you want to know more about BCBC, then please take a look at our website and check out the talking slides from this year’s conference. I look forward to welcoming you to our 70th anniversary celebrations in January 2018! Jerry Wulf "Continuous genetic improvement is a must; genetics steer the whole beef supply chain"
Jerry Wulf is a cattle breeder based in the USA. Jerry Wulf ’s family business has gone from strength to strength in the 60 years since it was established and technology linked to genetic data has played an important role in meeting buyer demands. The integrated Wulf Cattle business, which covers three states in the USA; Minnesota, South Dakota, and Nebraska, started out as a beef cattle feeding enterprise and the family has since added an improved genetics programmes, based on the Limousin breed. Cross breeding is combined with heterosis, to produce cattle which perform to a high standard and yield a high quality carcass. Jim Dickinson is a dairy farmer and milk processor from Huddersfield in West Yorkshire. Under the Longley Farm brand, he sells a wide range of products, including butter, cheese and yogurt. Mr Dickinson gave a thought-provoking presentation, which outlined the benefits to farmers from paying greater attention to the requirements of processors and focusing production on milk components in greater detail, to better suit the market and to potentially improve returns. He pointed to the lack of contact between cattle breeders and milk processors. Farmers had got the message that butterfat had a value, breeders knew how to select for it and nutritionists understood the feeding principles. But there was little too emphasis on the quality of the components themselves. “Milk fat is produced by cows in the form of globules. These globules vary in size and can depend on the breed. On average, fat globules from Holstein cows are smaller than those from Jerseys. A very significant proportion of the milk in this country is put through centrifugal separators to make cream and very large fat globules can cause a problem, because they are more fragile and more likely to rupture and create ‘free fat.’ This means it is a lot harder to make good cream from Jersey milk than it is from Holsteins. “Broadly speaking, when cows produce higher levels of butterfat –either through breeding or feeding – fat globules in the milk increase in size. So increasing fat levels is not a good move, if the aim is to make high quality-cream. Furthermore, it is not advisable to take a naturally high-fat, high-saturate breed like the Jersey and encourage it to produce even more fat and saturates by feeding it protected saturated fats based on palm oil , which I will refer to as C16." “C16 is undesirable, as it will not melt in the mouth, so once it is no longer encapsulated in a globule it will remain, leading to an unpleasant, unpalatable and greasy product. Everyone knows that feeling of needing a good hot cup of tea after a plate of greasy fish and chips; that is not what people want from a bowl of strawberries and cream. At the outset, fat standardisation was a bonanza for the processors. But at present, all the extra value was being handed back to the supermarkets, resulting in a national surplus of butterfat and a devaluation of the market for potted cream. But it could be said that consumers were not only benefiting from cheaper milk as a result, but that the industry was generating butterfat at world-market prices. David Speller "Biosecurity is everything"
David Speller’s company, Applied Poultry, grows about 22 million broilers a year in the UK and offers consultancy advice for businesses as far away as Peru and Australia. The booking of a poultry farmer speaker might seem an unusual choice for the Conference, but David Speller’s presentation was highly relevant and extremely well-received. Mr Speller, who admitted that technology was developing faster than many farmers could fully utilise it, described several innovations being trialled on his unit. These included the E Nose, a device which uses smell to detect small changes in the bird to give an early warning of disease problems. The device offered great potential for reducing the use of medication for flocks and could be applied to other species, he said. He also had a number of robotic systems under investigation and these could improve farm biosecurity, he said, by keeping human contact with flocks to a minimum. “Biosecurity is everything,” he said. “Some 10% of the cost of putting up one of our buildings is spent on this aspect, which is vital to the business. We have key fob entry and a central access corridor, with all lorries remaining off site." Technology assisted with bird management by raising concerns before they could be visually observed by the stockmen, he stated. All of the technical features of the equipment were utilised and it also offered the facility to demonstrate that welfare standards were being achieved. Among the goals he had set for his business were to explore the potential of mobile sensors on robots and to continue to strive to reduce the level of bird medication that was necessary for a healthy and productive flock. The future offered the chance for poultry producers to achieve “true 24/7” monitoring of the livestock, by trained staff and technology combined, said Mr Speller. Professor Rutter is based at Harper Adams University and is involved in the National Centre for Precision Farming. He took delegates on whistle-stop tour of some of the technological advances that might be available in the future. Rumen pH sensors were one of the latest developments and these have a variety of functions, including measuring the cow’s temperature, disease detection and monitoring drinking activity, with sensors generally lasting for approximately five months, he said. Other innovations had been designed to use animal tags and beacons installed in the buildings, to allow livestock managers to pinpoint the location of individuals quickly. Other systems used video and 3D imaging, to highlight any cases of lameness at an early stage, for more effective treatment. Dr Stephen Conroy "Some progress has been made on the heritability of eating quality traits"
Dr Stephen Conroy is the manager of the Progeny Test Centre in Co Kildare, Ireland. The incorporation of meat quality measures into beef breeding goals has occupied the industry for some time and Dr Conroy cited as an example the Irish Cattle Breeding Federation (ICBF), which was launched in 1998, as a non-profit organisation. It provides cattle breeding data to the Irish dairy and beef industries. Dr Conroy said the route to the production of the ICBF database had been a “difficult road,” requiring farmers to perceive merit in the system. This had been achieved through the publication of genetic indices which helped them to make profitable decisions. Researchers were currently looking into ways in which breed data could be used to select animals which produced meat with improved eating quality. “We are breaking down the carcases into 19 cuts, to monitor pH, marbling and colour,” said Dr Conroy. “Trained panellists then taste each cut and give it a rating, according to tenderness and flavour." “Some progress has been made on the heritability of eating quality traits, which have been identified as 25% heritability for tenderness and figures of 8% and 13% for juiciness and flavour respectively." George Lyon "Surely we can do better than the CAP and produce a system more targeted towards our own industry?" George Lyon is an agri-food and energy consultant with Brussels-based firm, Hume Brophy, as well as being the AHDB’s independent director and a former MEP. George Lyon opened his presentation by confirming that the future post-Brexit held the promise of increased competition from cheaper imported food products. He suggested that farm support in England and Wales may be phased out post-Brexit, with the possible exception of upland suckler farms, which could have their payments linked to the delivery of environmental benefits. Meanwhile, he did not rule out the possibility of continued funding for Scottish farmers. Despite the challenges ahead, Mr Lyon pointed to several potential opportunities. “We have a relatively healthy home market for high quality beef and, hopefully, our new UK farming policies will be tailored to meet our requirements. Surely we can do better than the CAP and produce a system more targeted towards our own industry?" Mark Berrisford-Smith "It is not a question of whether we experience a hard or soft exit from the EU but of whether it will be a hard exit, or one that can be compared with falling off a cliff"
Mark Berrisford-Smith is head of economics for HSBC’s UK commercial banking business. He pointed to the importance of trade negotiations in the post-Brexit future. “It is not a question of whether we experience a hard or soft exit from the European Union, but of whether it will be a hard exit, or one that can be compared with falling off a cliff,” said Mr Berrisford-Smith. Mr Berrisford-Smith forecast a “rocky road ahead” for farmers and believed that the recent appointment of Donald Trump as USA president would hamper progress on future trade deals, especially those related to currency affairs. “Since the end of World War Two, we have seen the liberalisation of global trade and lived through an era of relative security. The appointment of Donald Trump could result in a retreat to the 1920s. The CAP evolved slowly, but if decisions are left to UK politicians, we could be entering a period of rapid change. “Producers have historically been protected by the support scheme and by trade agreements linked to our EU membership. Only the good farmers can hope to survive in the future post-Brexit,” he concluded. Fern Pearston is the animal genetics manager at AHDB Dairy. She presented the development of a lameness breeding index, work which was initially investigated by a PhD student, Alex Brown, on placement with AHDB Dairy in early 2016. It has been continued by the genetics team at AHDB Dairy alongside their research partners EGENES. Conference delegates always look forward to the PhD student presentation and Fern Pearston’s presentation did not disappoint. Using data from both major UK milk recording organisations, she described how she had found a heritability of 9% for lameness, when using an animal repeatability model. Preliminary EBVs for around 55,000 sires were also presented ranging from -30% to +30%. Indicating that using a favourable lameness bull over an unfavourable one could result in 60 less cases of lameness per year, on average, in a 100 cow herd. Based on this preliminary work a genetic index for the trait could be available in the near future, she told the audience. Miss Pearston, who also made use of type and conformation information from Holstein UK classification records, presented relationships between lameness in lactation 1 and select type traits; rear leg side view, foot angle, body condition score, locomotion and overall foot and leg. The size of some correlations were unexpected so these values were not presented. Miss Pearston explained that more work will be carried out in this area and final correlations will be compared to those found by other countries which produce foot health breeding indexes. Other future developments included estimating genetic correlations between lameness events, reviewing and potentially including Digital Dermatitis in the evaluations, and finalising trait definition; whether lameness should be evaluated as multiple or a single event per lactation. Hoof trimming data is also available but two issues must be overcome before this data can be included; standardisation and volume of data available. Genomic evaluations for lameness may also be an option. Over 4,000 sires with a preliminary EBV also had a genotype with 3,800 of these sires receiving a lameness reliability of over 30% and 2,800 of those having a reliability score of more than 50%. Miss Pearston took the opportunity to inform the audience of the plethora of genetic indexes AHDB Dairy will be releasing this year and into 2018. These included mastitis evaluations (release April 2017), the feed efficiency index, which AHDB Dairy used the dairy workshop to gather industry input (estimated release end of 2017). Another area under investigation is the evaluation of carcase traits, which is being carried out in partnership with AHDB Beef and Lamb and HCC (Hybu Cig Cymru). Stuart Roberts "Without trade, everything else is insignificant, not just internationally, but domestically"
Stuart Roberts is a beef cattle producer from Hertfordshire and county NFU chairman. 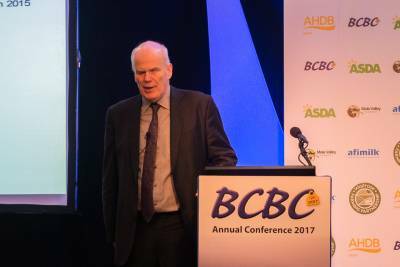 He spoke at least year’s Conference and has also previously held senior positions at Defra and the AHDB. Mr Roberts gave an upbeat view of the future of the beef industry in the post-Brexit UK and stressed the importance of making sure that farmers got their message across to the public. He described the leave vote as a “seismic” change for the industry and predicted that the impact would be felt by many future generations to come. “It is time to have a new contract between farmers and society and it needs to recognise the contribution that farming makes to our country, beyond a simple contribution towards the economy,” he said. Farmers had not been adept at explaining the benefits the Single Farm Payment offered to society and communication must be improved, he stressed. He also stated that the EUROP grid was outdated, having been designed in the days when the requirement was for the ideal product to go into an intervention store. In turn, the industry should increase its focus on customer feedback and this would drive competitiveness. There were three main priorities: trade, trade and trade, he said. “Without trade, everything else is insignificant, not just internationally, but domestically. It is fundamentally important that we get it right. The sheep industry’s reliance on exports makes it very fragile. Within the beef industry, the people who should be the most concerned are the Irish beef farmers, who are also heavily dependent on exports. It is fundamentally important that we get trade deals right. High optimism was tempered with references to the challenges which lay ahead. “We are entering a period of huge uncertainty that we have probably never seen before. In this situation, it will not be the biggest, the wealthiest or even the most intelligent farmers who survive, but those who are the fastest to react; that is going to be the most critical quality that will help us to succeed,” said Mr Roberts. Professor Meuwissen is a researcher from the Norwegian University of Life Sciences, but highlighted the work carried out by researchers in the USA, who had made progress on discovering more about DNA links to cholesterol deficiency, allowing breeding techniques to remove the relevant population from the national herd. He said: “Due to the cross breeding involved in beef production, across-breed genomic selection becomes even more important, particularly as breeding populations are relatively pure. 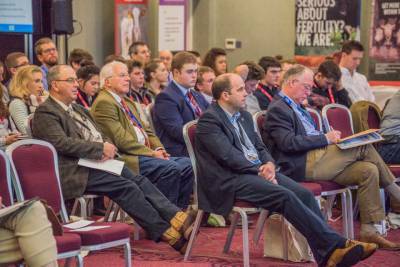 The workshop events at the British Cattle Conference always provoke a lively debate and the 2017 beef session was no exception. The invited speakers came from the three new Centres for Agricultural Innovation: CIEL (Centre of Innovation Excellence in Livestock); Agri-Epi (Agricultural Engineering Precision Innovation Centre and Agrimetrics (the data centre of excellence for the agri-food industry). It was, commented workshop chairman, Professor Mike Coffey, the first time that the organisations had been brought together to give presentations at the same event. Dr Mark Young of CIEL explained that the organisation had been set up to equip the livestock sector to move forward, by forging closer links between science and industry, with a focus on enterprise profitability. Its role is to enable collaborations between industry and research. Professor Mark Rutter of Harper Adams University, who was also a Conference speaker, outlined the goals of the Agri-Epi Centre, which was established to develop precision agriculture and innovation in agricultural engineering. It aimed to improve farm economic performance, by turning science into practice. The predicted growth in world population over the next decade was 10% in the developed world, with a figure of 20-30% for the undeveloped world, said Professor Rutter. This would present significant challenges to UK farming and among Agri-Epi’s current projects was the use of data collected by the Formula 1 motor racing team and the potential for expanding the utilisation of drones. Meanwhile, Agrimetrics spokesman, Professor Richard Tiffin, stressed the need to manage data within the industry. “Agrimetrics is the world’s first data centre of excellence for the agri-food industry,” he explained. “Some 95% of data has been collected within the past two years and the volume continues to grow; it is vital that it is managed efficiently." 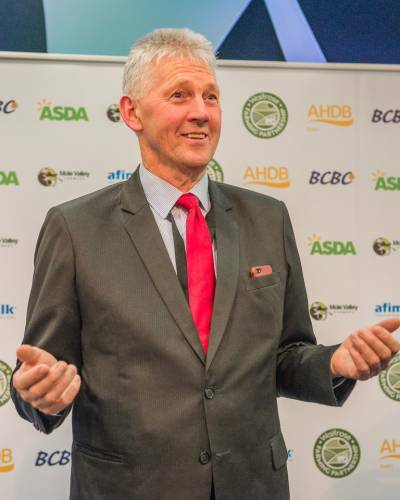 Summing up delegates’ reaction to the workshop presentations, chairman Professor Mike Coffey said the world was changing “fundamentally and fast” and the UK agricultural industry needed to respond and adapt to these changes. “There is a general willingness to engage with the centres for innovation, although there has been some surprise that they have been set up with relatively little consultation to industry,” said Professor Coffey. “If we do not act quickly, there is a risk that our industry will be left behind." The event marked the occasion of the BCBC presidential handover, following the completion of Dr Maurice Bichard’s six-year term. He handed over the title to Professor Mike Coffey. 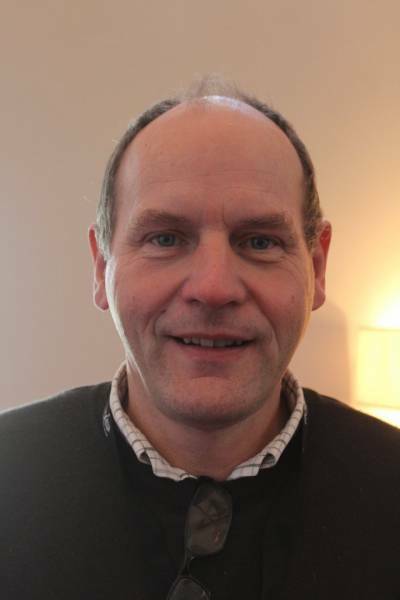 Professor Mike Coffey is a Professor in livestock informatics at the SRUC, based in Edinburgh. He is one of the world’s leading breeding specialists and geneticists, with a particular interest in genomics. As well as lecturing at the College, Professor Coffey is involved in the development of new breeding tools and innovations for the management of farmed livestock and participates in a number of related research projects. He enjoys the challenge of ensuring that scientific research delivers immediate benefits for livestock farmers. The British Cattle Conference provides a unique opportunity to meet other breeders and scientists in a warm and friendly environment and the 2017 conference was no exception, providing an ideal opportunity to network during the conference and evening events which included drinks receptions courtesy of Neogen Europe and Shearwell Data Ltd and the annual club dinner. Burns Night Dinner: The outgoing BCBC chairman, Iain Kerr, is Scottish and the Club’s evening dinner coincided with Burns night, so a Burns Night theme, complete with bagpipes and a haggis starter, was chosen by the Club committee. It was followed by delicious beef, courtesy of Waitrose and Dovecote Park, after which guests heard from after dinner speaker, Alastair Sneddon, who offered his observations gained from 40 years of livestock auctioneering. 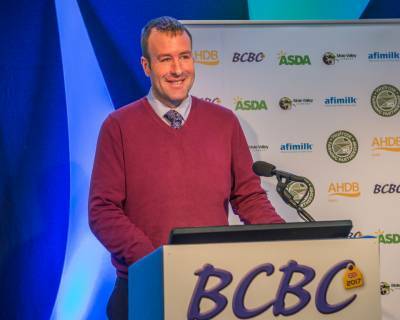 Sponsors: The BCBC would like to extend grateful thanks to the 2017 Conference sponsors: AHDB Dairy; Afimilk; Mole Valley Farmers; Asda; Waitrose Farming Partnership; ABP UK; AHDB Beef and Lamb; Alltech; British Limousin Cattle Society; CIS; DairyPro; Dovecote Park; Egenes; ForFarmers; Hereford Cattle Society; Holstein UK; Merial Animal Health; MSD Animal Health; Neogen Europe; NMR; Shearwell Data Ltd; Shepherd Publishing; Shorthorn Cattle Society; SRUC; Viking Genetics; Zoetis. 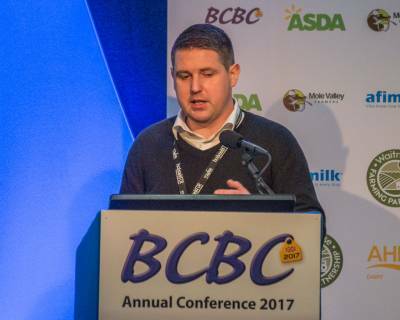 Presentations: If you were unable to attend our 2017 Conference in January, you can catch up on the presentations, courtesy of Mole Valley Farmers, which sponsored the ‘Talking Slides’ which can be accessed through the presentations section of the website. The Slides show 2015, 2016 and 2017 presentations. 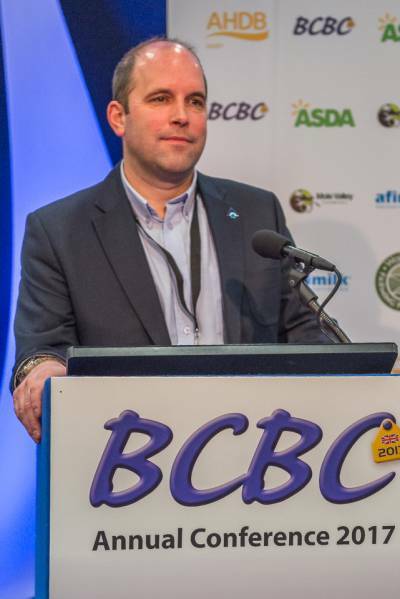 New Chairman Andy Dodd: The 2017 Conference saw the appointment of Andy Dodd, as the new BCBC chairman. 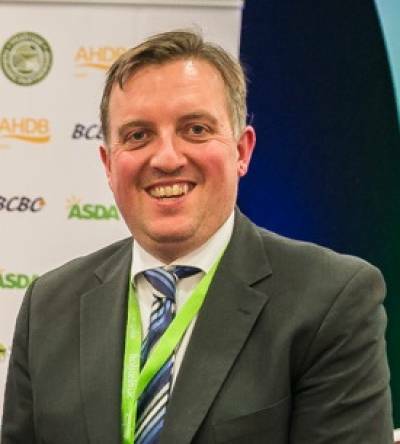 Currently the breeding and fertility technical manager of AHDB Dairy, he brings a combination of practical skills and technical expertise to his role as chairman. Mr Dodd was a dairy unit manager, following his graduation from Harper Adams University. While his experience is wide-ranging, his specialist responsibilities include the application of bull proofs and the PLI index, as well as the use of the Herd Genetic Report on farms. 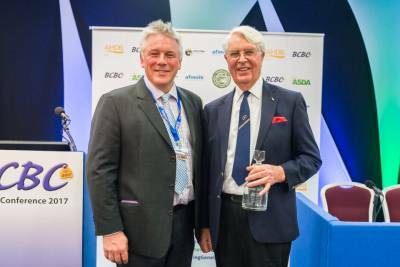 Mr Dodd took over the chairmanship from Iain Kerr, who is the chief executive of the British Limousin Cattle Society and an elected member of the World Limousin Executive. 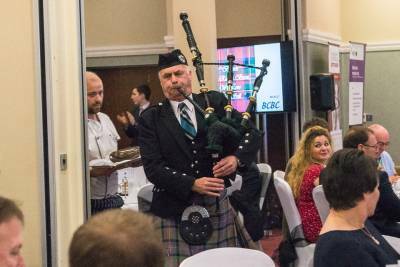 The year 2018 will mark the BCBC’s 70th Conference anniversary and planning for some special celebrations at next year’s event is already underway – we very much hope that you will join us. The Conference is one of the highlights of the farming calendar, bringing together experts from around the globe, who offer their perspectives on technical issues which are highly relevant to the UK cattle breeding industry. The Conference also hosts presentations from some of the best and most innovative farmers, both at home and abroad. The Conference covers a two-and-a-half day programme, which begins with a workshop session. In 2017, this was focused on the Government’s new agricultural technologies strategy. On the second day, the programme covers the beef sector, followed by an evening dinner, usually with a guest speaker. The final day of the Conference is dedicated to the dairy industry. Sponsorship: Our regular sponsors find that the Conference, which attracts some of the most influential and knowledgeable experts within the cattle industry, offers an ideal platform for sharing information about their activities. There are several options available for getting involved; please get in touch with our secretary, for more information. Stay Over? The British Cattle Conference is traditionally held at the Telford Hotel and Golf Resort in Shropshire, a venue that has been selected for its high level of customer service, good food and quality of accommodation. The Hotel also has its own spa, swimming pool and golf course. Accommodation can be reserved by our secretary, Heidi Bradbury, once event booking has opened, although overnight places are limited. 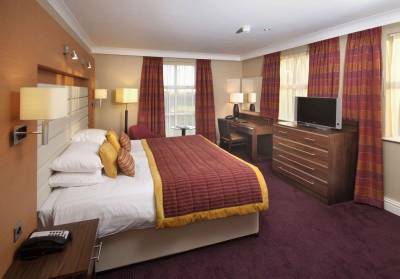 Rooms in a second local hotel may be available, once the Conference hotel has been fully booked. The full programme and booking details will be available in the autumn.